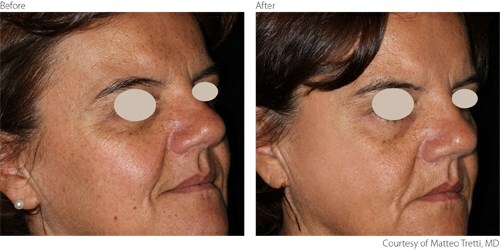 Skin resurfacing procedures use lasers to reduce the signs of aging and improve skin texture, laxity and tone. 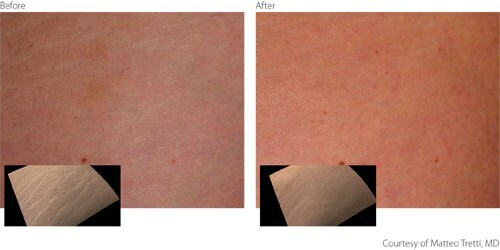 They are also used for scar and stretch mark reduction as well as for treatment of a variety of other cosmetic concerns. 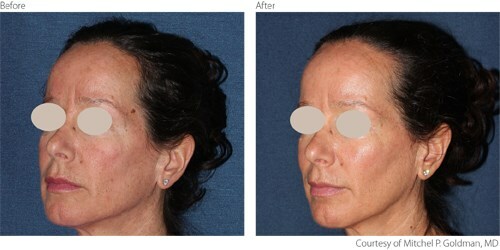 Skin resurfacing can be achieved with either ablative or non-ablative lasers (see Ablative Skin Resurfacing). Non-ablative resurfacing keeps the skin intact, stimulates collagen growth and tightens the underlying skin. It is ideal for patients who prefer a milder treatment approach with less downtime and no risk of skin infection. The Lumenis ResurFX™ is the only true Fractional Non-Ablative solution on the market. It uses an advanced scanner technology called CoolScan™. CoolScan™ uses a sophisticated, patent-pending algorithm for non-sequential scanning which ensures that the energy delivery is precise and homogenous, so the required coverage is achieved in only one pass. The ResurFX™ module is available as part of the M22™ multi-application platform. Effective and safe results in a single pass with a state-of-the-art CoolScan™ scanner that enables precise and homogenous energy delivery. Ability to tailor treatment parameters perfectly for each patient and condition using the CoolScan™ scanner, which allows a choice of over 600 combinations of shape, size, density and energy settings. Integrated contact cooling for enhanced patient comfort. Cost effective with no required disposables.